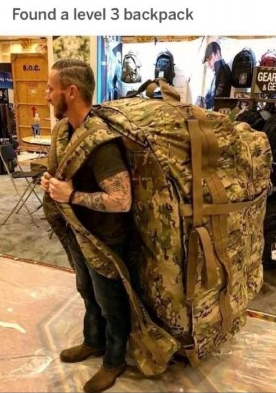 Discussion in 'Bags, Gear And Load-Outs' started by Djcala, Oct 22, 2018. Ok make this short sweet. Bought wife a Drago Assault Pack(37liter 5 day pack), 6 years ago when she was going on road as Deputy. Too obviously carry a bunch of miscellaneous cop crap lady crap etc.... Its been toted dragged chunked wet dry hot cold in cars trucks ranges woods 4 wheelers boats you name it. It has not been babied. Finally some wear is beginning to show shoulder strap area. See pic. Why am i telling yall ?? Simply when companies do good i like to tell same as when they dont. I sent Drago Gear an email and couple pictures,, they responded quickly with a couple questions a. What is our mailing address and B. What color preference for new bag being OVERNIGHTED !!!! WOW, is Drago Gear the #1 best gear ever NOPE, is it good and servicable with fair price and warranty ? YEP for sure. If ya need a decent couple day gear pack that is comfy good load bearing come WITH a good hip belt. The Drago Assault aint a bad option. In all honest with the web in place on straps and the stiching solid i believe the old one will still go MAnY MORE years as is. nitesite, meanstreak and Elbert Garrett like this. report Dj and excellent pics. It's always good to hear good, positive results about products. Usually all we hear is when someone is unhappy. Thanks for sharing. John A., Elbert Garrett and Djcala like this. I concur for sure. I thought they really desrved a plug. Responded in under an hour with an unexpected resolution no fuss no muss, no dumb can ya send us a 6 yr old receipt blah blah blah. Simply we need an address i even told them i believe it will hold fine a long time that the tears to pad seem cosmetic more than functional problem. Good service I like. Ok lastly, brown truck did deliver as Drago promised brand new bag arrived this one in green i like. Noted a couple changes they have added a hook/loop id panel on back and more important they have added webbing across the entire top of shoulder strap which addresses the problem we had noted(after 5+years). Well done good company. DJ, you are definitely going to have to replace that. Here you go.